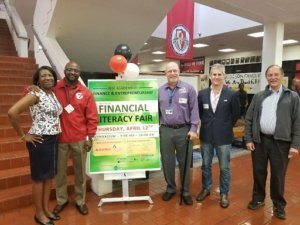 MIAMI, FL (April 12, 2018) – Miami Bayside Foundation was honored to partner with Communities in Schools’ for their Financial Literacy Boot Camp at Miami Edison Senior High School. This program helps to build a solid foundation for financial literacy that provides important life skills for students before they move out on their own. MBF’s Director of Loans, Michael Sellinger, along with other community volunteers and sponsors provided proactive money management guidance to assist students in developing the necessary money management skills to address many of the money decisions and issues they’ll face as adults.